‘Catastrophic’ results of climate change: the floods will not relent, causing trillions of pounds worth of damage. 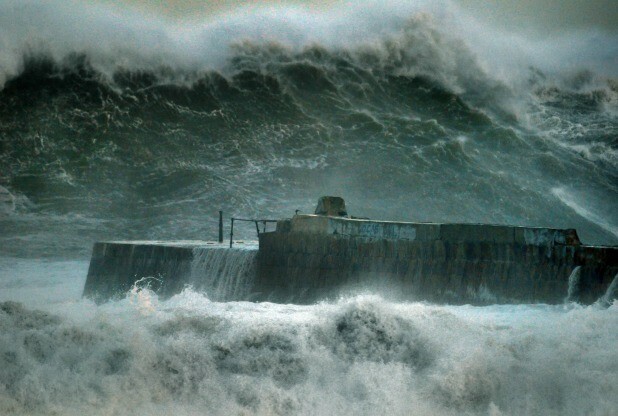 A timely study suggests that damage from storms on coastal areas could increase up to tenfold, from £10,000-40,000 billion globally today to £100,000 billion by the year 2100. In the face of relentless storms over the past weeks in the UK, and after typhoons and hurricanes across the world, the study highlights the hand that climate change has had to play in the extreme weather we have seen. Led by the Berlin-based Global Climate Forum in association with the University of Southampton, the researchers simulated results of flood damage over the next century to coastal regions across the world. The damages will increase as a direct result of rising sea levels, attributed to our warming climate. This, coupled with population and economic growth in coastal areas will see storms increasing in power and devastation, with up to 600 million people affected by coastal flooding by the end of the century. Asia and Africa both have rapidly growing coastal cities, and the researchers suggest that they may be the hardest hit. However, Europe is in need of mitigation too, as shown by the weather hitting the South West of England at this very moment. Coastal areas have been advised to invest more in protection measures, such as building flood gates and dikes. This could reduce projected damages by 20%, but could potentially cost more each year to build the protection measures than it would save. Where investments are made, the study warns that in the instances of failure, the results could be “catastrophic”. Some of the countries that are projected to be hit the hardest are also the poorest, and might be unable to tackle these problems alone. The researchers suggest that they will need international support, but with every country facing the problems that increasing climate change is posing, will anyone be able to afford such support? Even if they can, the recent Climate Conference in Warsaw confirmed that international finance mechanisms are proving slow in providing support for adapting to climate change. 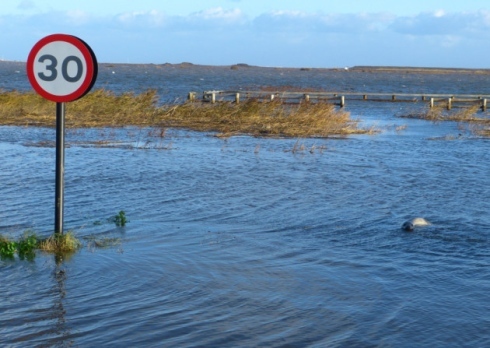 A flooded habitat in Norfolk, with a seal far away from its usual haunt. impact does this have on wildlife? Even small increases of sea level rises can have detrimental impacts on coastal habitats. The salt water can cause erosion, flooding of specialist wetland habitats, contamination and loss of habitat for fish, birds, mammals and plants. There have also been recent reports of grey seals being washed up into villages from the powerful waves, or swimming up flooded plains. The ultimate cause: why are sea levels rising? Research suggests that sea levels have been rising at an average of 3.5 millimetres per year for the last 20 years, which is about twice the rate of the preceding 80 years. Our climate is warming thanks to our gluttonous burning of fossil fuels, which releases heat trapping gases into the atmosphere. This has led to the additional heat on the Earth’s surface, of which the ocean absorbs about 80%. When water heats up, it expands. Causing the sea levels to rise and occupy more space. Frozen water in glaciers and the polar-regions also melt at a greater rate, contributing to the rising sea levels. If we do not reduce greenhouse gases sufficiently, some countries will have to consider relocating substantial parts of their populations away from coastal regions. Some studies predict sea level rises of 2 metres by 2100, whilst others predict rises of up to 7 metres if the Greenland ice caps melt. This is enough of a rise to swamp London and Las Angeles, let alone the rural and coastal locations that are home to other people, plants and animals. Next ArticleHungry polar bears turn to sea bird eggs in warmer climates.